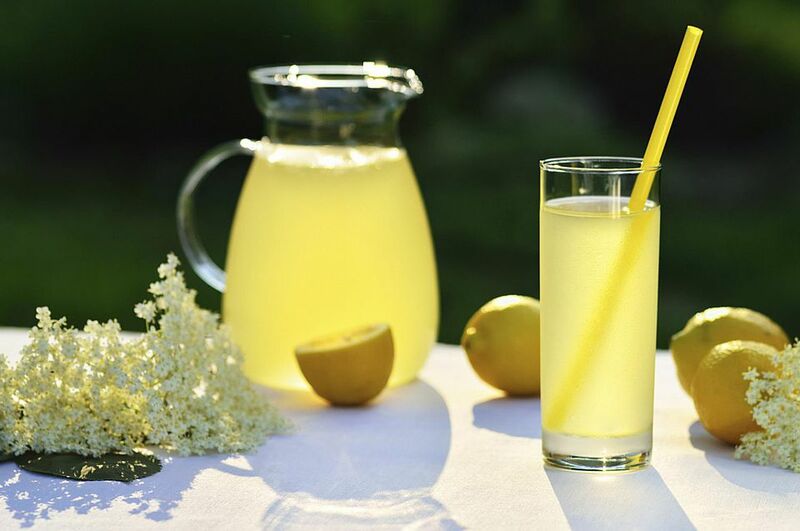 One of the most refreshing drinks for the summer is an elderflower cordial. This recipe is quick, easy to make, and a great excuse for a long walk collecting flowers. The elderflower season is short—late May to mid-July if you live in the north or in Scotland. The heavily scented flowers make a wonderful, refreshing drink which, when stored in sterilized bottles will keep for several weeks. A word of warning—if you are out collecting elderflowers, make sure you have permission to pick them and never pick flowers from trees on roadsides as they may be tainted with gas fumes. Although the cordial does make a refreshing drink, it also is useful in many other recipes too. Place the sugar in a large saucepan, stockpot, or a large Pyrex bowl. Pour the boiling water over and stir until all the sugar has dissolved and let cool. Grate the rind of the lemons with a fine grater and add to the sugar water. Slice the lemons into thick slices and add to the water. Add the citric acid and stir. Finally, add the flower heads to the water and stir again. Cover with a clean cloth and leave to steep for 48 hours. Strain through a clean fine muslin cloth into a clean bowl. Using a funnel, fill sterilized glass bottles (see note below). Seal and store in a cool, dark place (not the refrigerator) for a few weeks or process in a water bath to preserve for longer storage. Another option is to freeze in plastic bottles. Once you open a bottle, it must be stored in the refrigerator. The cordial is delicious diluted with still or fizzy water or used as a flavoring in ice creams, fruit fools (puréed fruit mixed with whipped cream), and other recipes. To sterilize the glass bottles, rinse in the dishwasher, or place in a medium hot oven (300 F/150 C) until the bottles are warmed through but not red-hot. Handle with care.